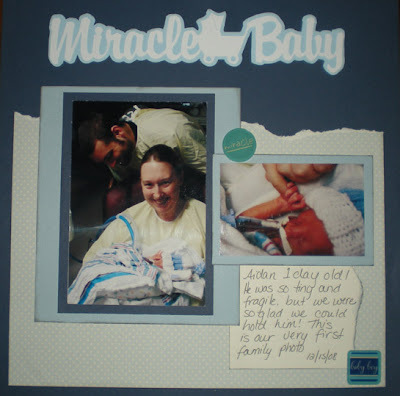 Sayers Journey: Scrapbooking? What's that? That's exactly how I felt sitting down to scrap this morning! I hadn't done it in soooo long it's like starting brand new again. And you can tell! When I haven't scrapped for a while I'm not as impressed with my pages than if I was on a scrapbooking roll and doing several layouts over a weekend or so. 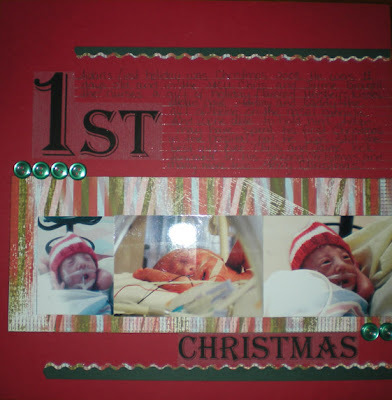 But my goal is to have the book done that is my pregnancy and Aidan's NICU stay by his 1st birthday party. It would be grand to have his whole first year done, but who am I kidding... I got 2 pages done today and hadn't worked on the album since April! YIKES. But I only have 5 pages left to finish the book... I think I can manage that one! I think I might try to get Aidan's 1st year done before his birthday. It's a big project, but before I know it he'll be turning 2, then 3 and I still won't have his first year done. Guess I need to get cracking! Happy Scrapping!